"Easy to make and easy to clean up! Delicious with rice pilaf or couscous." Combine carrots, half of chopped dill, lemon juice, salt, and ground black pepper in a bowl. Cut 2 pieces of parchment paper or foil into 12x18 inch rectangles. Brush the inside of parchment rectangle lightly with melted butter. Arrange carrot mixture over half of each parchment rectangle. Top carrot mixture with halibut fillets. Season with salt and ground black pepper. 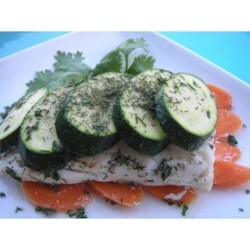 Place zucchini slices on top of each halibut fillet. Sprinkle with remaining chopped dill. Fold the parchment paper over fish. Make a 1/2 inch folded edge and crimp to seal. Set packages on baking sheet and bake in preheated oven until fish flakes easily with a fork, 12 to 15 minutes. Ideal pairing of salmon with butter sauce, dill and lemon. Very simple to make. I didn't have any carrots so I just combined the succhini, lemon, dill and fish in a foil packet. Tiny bit bland so it needs a tasty side dish to go with it.